If desired, donations in Boucher's memory can be made to St. John's Presbyterian Church or the Friends of Tabusintac Nursing Home. 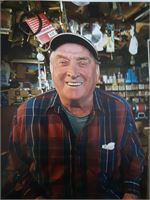 Palmer, Boucher Charles Clifford Reginald passed away Wednesday, January 23, 2019. Our Dad was born on July 28, 1923 in Tabusintac, New Brunswick and was the youngest child of the late Henry and Dora (McLean) Palmer. He married our Mom, Jean Hierlihy, on October 10, 1953. They just celebrated 65 years of marriage. He was also predeceased by his sisters, Clara and Gwen, his brothers, Doug and Andy and his daughter Barbara Jean. He leaves behind our dear Mom, Laurie Palmer (Angele) of Tabusintac, Wendy Colter (Lee) of Fredericton, Evan Palmer (Anne-Marie) of Tabusintac and Myrna-Lee Porter (Wade) of Woodstock. Ten grandchildren - Natasha Colter (Neil), Adam Colter (Sara), Matthew Palmer (Michael), John Henry Palmer (Jen), Phillip Palmer, Billy Palmer (Gaetane), Ashley Palmer, Jonah Palmer, Gilbert Porter and Lydia Porter. Eight great grandchildren – Nate, Will, Hudson, Charlie, Joeve, Judson, Hailey and Lucy. Dad worked for himself driving truck in the early years of his working life and then drove pulp truck for Consolidated Bathurst for 21 years. Dad loved being outside and was an avid hunter and woodsmen. He was a local historian and told such great stories. And of course, his handmade snowshoes and axe handles are treasures we all have in our possession. We will miss him greatly, we will talk of him often, we will be kind and we will give ourselves to those in need, just like our Dad. Dad was well takencare of at the Tabusintac Nursing Home since January 3, 2015 and the family wishes to thank all the staff that cared for him there. We will celebrate our Dad and his life at a service at St. John’s Presbyterian Church, Hierlihy Road, Tabusintac on Saturday, January 26, 2019 at 3:00 pm with burial at a later date in the Riverside Cemetery. There will be visitation the day before (Friday, January 25, 2019) from 2:00 pm till 4:00 pm and again from 7:00 pm till 9:00 pm. If desired, donations in Dad’s memory can be made to St. John’s Presbyterian Church or the Friends of Tabusintac Nursing Home.